Established in 2006, Visionary Media is a leading integrated all-media operator who dedicates to pursuing originality and providing award-winning programs to major broadcasters. Visionary Media is also the content provider that owns the most original TV programs. The company owns leading research and development team, directors and operation team. The core businesses are the creativity, design, produce and distribution of programs, design and execution of events, and digital media business. In 12 years, Visionary Media has achieved lots of success in entertainment programs, reality show and talk show, and has successfully launched more than 70 competitive TV programs, for example , , , , , , , , etc. 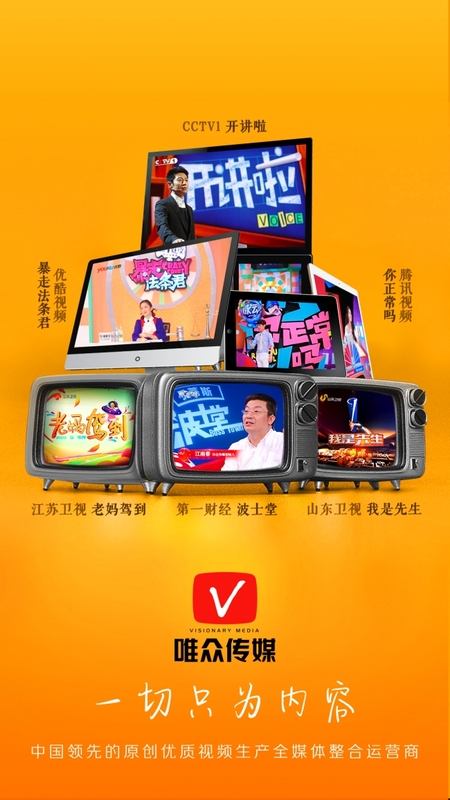 Visionary Media has won hundreds of major awards, and was crowned “Top Brand of Culture Program in China”. 2017, “Best TV Produce Company in 2016-2017 in Mainland China”, “Excellent Entertainment Marketing Company”.